Following Labor’s final round of leadership spills in July, the member for Chifley, Ed Husic, was appointed to the Labor ministry, and received some seriously disreputable public criticism about taking his oath of office on the Koran. Responding on ABC Lateline, Finance Minister Penny Wong dismissed public criticisms of Ed’s religion, stating that the sorts of comments she’d heard were “not worthy of the best of Australia”. Her statement leads us to an important point, that the Australian media largely do not see fit to consider or explore (aside from SBS). Constitutionally, the rights and obligations conferred by Australian citizenship are few and far between (aside from implied freedoms of religion for instance). Many Australian scholars (starting with Rubenstein) have explored how these rights and obligations are dispersed across an array of legislative instruments. While there are some commonly understood advantages to possessing Australian citizenship, such as the right to dual citizenship, or access to social welfare, the two key constitutional principles are in fact the right to vote, and to stand for elected office. These modes of political participation are some of the few fundamental ways we are formally bound together as a body politic. You would think the diversity of our parliaments would therefore be an important measure of how our democracy is travelling, especially following the end of racially discriminatory immigration policy in 1973. Australians are clearly more comfortable with talking about what it means to be Australian in a cultural or national sense, rather than in political or civic terms. 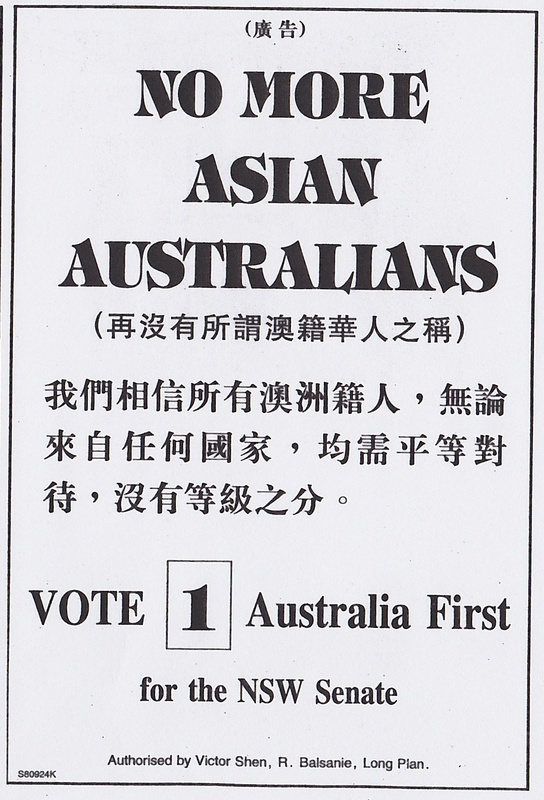 There have been many candidates from Asian Australian backgrounds who have stood for elected office over the last thirty years, but the pattern has generally been (aside from Asian Australia’s brief flirtation with multicultural politics through the Unity Party) that Asian Australian candidates have stood for the major parties and have been nominated to unwinnable or highly marginal seats. At the Commonwealth level, notable parliamentarians of Asian Australian ancestry have been Senators Bill O’Chee (QLD), Tchen Tsebin (VIC), Penny Wong (SA), and most recently Lisa Singh (TAS), and in the House of Representatives, Michael Johnson (member for Ryan). Is this election any different? Well, progressives may be familiar with Greens ACT Senate candidate Pakistani Australian Simon Sheikh or Labor’s Bennelong candidate Chinese Australian Jason Yat-sen Li. They have a chance, though Li’s seat may be more marginal than we suppose. It is less likely for candidates like Wesa Chau (ALP) in Higgins, Alex Bhathal (GRN) in Batman, Rachel Jacobs (GRN) in Brisbane, Dinesh Jayasuriya (GRN) in Gorton, or Daryl Tan (ALP) in Curtin. The Coalition also has an array of Asian Australian candidates in unwinnable seats, endorsing at least 12 candidates of Asian Australian background. However, a significant Coalition swing means that the Asian Australian representative landscape is poised to change. A dominant win will mean a number of marginals may change hands, including for David Lin in Rankin, Andrew Nguyen in Oxley, John Nguyen in Chisholm, and Ian Goodenough taking over Mal Washer’s seat in Moore. Remember the international spotlight that was briefly pointed at Greenway Liberal Jaymes Diaz’s one-out-of-six Stop the Boats plan? He too might still get into parliament. This story is perhaps vastly more important than the high profile Asian Australian candidates that the progressive side of politics has put up, largely because (as John Nguyen’s statements on refugees imply) this is not necessarily a boon for progressive politics. To understand how diverse Asian Australians are in political outlook, you only need to look at conservative outliers, from the Hamster Wheel lampooning Family First candidate Henry Heng (WA) to the insidious politics of intolerance proposed by Rise Up Australia Party’s Pastor Daniel Nalliah (who is Sri Lankan Australian). Put simply, the overlap between Asian Australians involved in politics and ‘Asian Australian politics’ is less than ideal. For me, Asian Australian politics is defined by a kind ‘radical inclusivity’, particularly in the domains of the arts, identity politics and national culture. This kind of politics has strong avant-garde modes of expression, but finds itself harder to translate to middle Australia, and to conventional modes of political participation. The ultimate problem is that there are very few channels to amplify Asian Australian politics, in essence, the participation of Asian Australians in progressive politics. This is an important step, because Asian Australians are still fundamentally impacted upon by anti-Asian racism (even in Canberra). This is also at a time where we are hearing a lot about the Asian Century, and at a time when our society is more successfully multicultural than it has ever been. In the wake of this election, perhaps the most important thing that Asian Australians can consider is our role in shaping a more inclusive political future. Certainly that’s the conversation I want to be involved in.